The French music mag, New Noise, has a nice feature/interview with me in their latest issue. I’m not able to read it, because it’s french, but I do like that it’s titled “Fraggles Rock”. 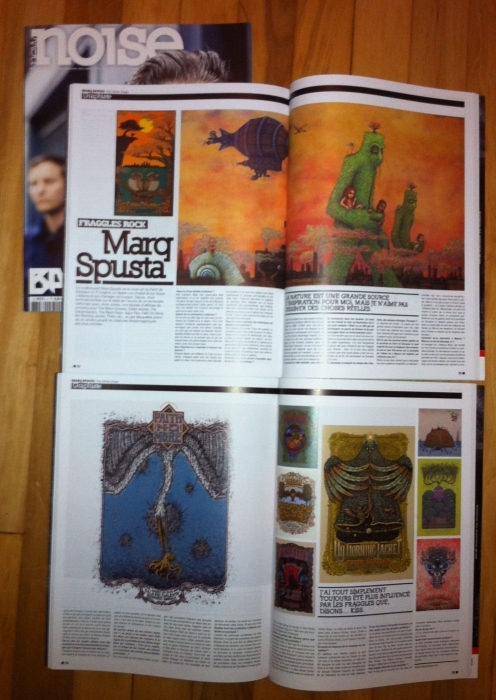 Thanks to Olivier Drago and New Noise for the nice press. Well deserved Congratulations are in order !! I wouldn’t sweat not being able to read it too awfully much. I’d imagine many of the folks able to read it will merely look at the pretty pictures anyway…besides, if you had someone translate it for you, I’m sure much would be lost in the translation. A picture is worth a thousand words and you’ve got a slew of groovy pics right there man! Your name is placed large & prominent so even the page-flippers can remember it. Thats sheer awesomeness! Yeah, just read it and went straight to type your name on google. Definitely some great stuff here! Plus, being in Noisemag is quite a good publicity!